For further information on the products and services we offer and areas in which we can help your business please download our brochure. For detailed information about our linear displacement potentiometers please download the following datasheet. Telescopic Position Sensor Data sheet. For detailed information about our telescopic position sensor please download the following datasheet. Water In Oil Detector Data sheet. For detailed information about our water in oil detector please download the following datasheet. 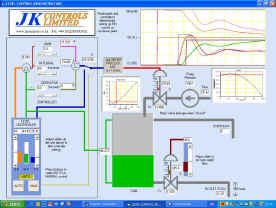 Download Interactive Demo of a SCADA Control System. Clicking on the image below will download an executable file that will run an interactive demo of a realistic simple non-linear SCADA system. You can adjust the plant conditions and controller settings and observe the responses in graphical form. Note: some virus protectors may require you to 'accept' the download of this executable file.